Of all caregivers, nurses tend to have the most interactions with patients. They're the ones that inpatients call if something is wrong, and they are also often the point of contact for the patient’s family. So nurses have perhaps the greatest opportunity to create a safer environment for patients. Implementing a web-based EHR will help to integrate a patient’s care across the continuum. No matter what a nurse's specialty is, best practice content will be embedded into their workflow. Web-based tools such as tablets and other devices also give them the mobility they need to focus on their patient, to talk and listen rather than document. 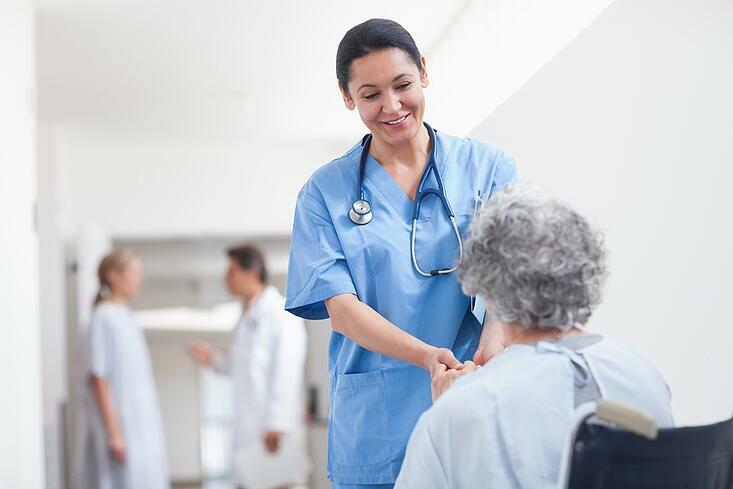 For example, nurses can sit with a patient at the bedside and review test results, discuss medications and how to manage pain, and manage their expectations more effectively while talking face-to-face. By scanning barcodes on patient wristbands and medication labels, nurses can verify all requirements of safe medication administration, as well as view vital lab results and diagnostic reports. Also, using an EHR with a mobile component will help them to conveniently review and document care from smartphones using web-based tools. For example, if a nurse gets a call from a patient asking for pain medication, the nurse can quickly grab that med and use the device to scan the patient, the med, and document administration within just a few moments. An EHR with a real-time surveillance component enables nurses to quickly monitor and identify patients who may be trending toward a bad outcome, such as sepsis or another potentially life-threatening condition. As surveillance quality boards analyze key clinical and demographic data across the EHR, patients who require attention are flagged. In addition, a solution with actionable boards can speed interventions through on-the-spot ordering, documenting, or messaging of the care team. A watchlist can automatically generate a list of patients that need immediate attention from a quality and safety perspective. Watchlists can be built around fall risks, restraints, sepsis, or any other potential danger that a nurse deems important. This tool can save nurses a tremendous amount of time over manually reviewing information and creating lists. With manual lists, as soon as they are printed off, the information is outdated. Watchlists created in real time give nurses the most recent patient information at their fingertips, including up-to-date lists of patients that they can monitor proactively. Evidence-based toolkits that are built directly into the EHR help clinicians to take a broader look at all the factors that go into adverse events and patient safety issues. These toolkits typically consist of optimal workflows, standard content, educational webinars, and other supplemental materials to help an organization improve outcomes and conserve resources. A nurse's top priority is to provide safe, quality care for their patients. Toolkits will help them to reduce errors, improve transitions of care, and ensure that the patient is always kept at the center of the care process. Interested in how nurses and nurse leaders can improve safety, even in the midst of the opioid epidemic? Read our special report. Cathy Turner, BSN, MBA, RN-BC is a member of the Healthcare Information Management System Society (HIMSS) and the American Nursing Informatics Association (ANIA), as well as director of MEDITECH’s Nursing Informatics Program.